Realmuto will certainly cost more money going forward. But basically, pre-extension, you get back the money spent by going from Alfaro to Realmuto if you also go from Hernandez to Kingery next year. Another confirmation that it was only 250K of pool money so we STILL have money to spend in the current period. Here's hoping that we have another Phillies high ceiling pitching prospect take a big step forward this year whether it is Morales or Gowdy or Pipkin or Starlyn Castillo or whoever. 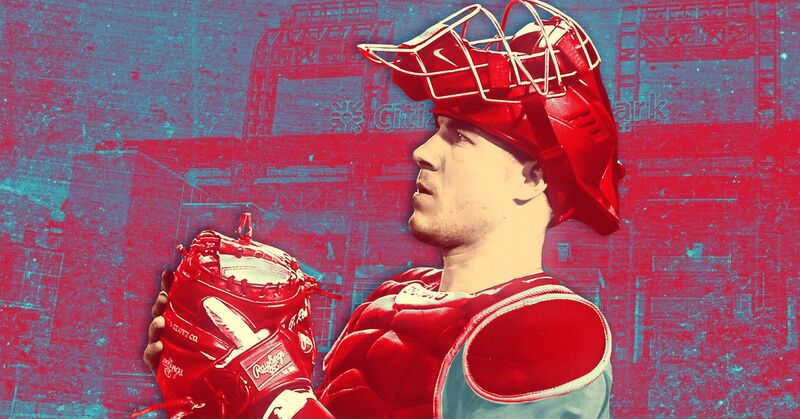 Philadelphia landed the best catcher in baseball, but at a cost no other team seemed willing to pay. When ownership said the team "might even be a little bit stupid," this isn’t what fans expected. Interesting. Most of the BA guys think the Phillies did great. Alfaro's framing was among the best in the league at one point last year, his arm is a weapon that few possess. That alone makes him a very good defensive C, and remember he is still learning, he is only going to get better. I see him already as a better defensive C than Realmuto, who is really just average (defensively). I just do not see this is a good place to throw Sanchez, who I suspect will be a very good prospect and we may see for years, adding in Alfaro as a guy who can shutdown running games and provide significant pop in a lineup (although low BA and OBP). We just didnt get enough for those two guys I fear, especially when we are going to be spending alot of money that we were not going to otherwise. I also fear that this is the "stupid" spending and we may not see Harper or Machado, but that is of course to be seen. Well, the "if" in his headline is a big if. No reason to think they won't get Harper or Machado. And if they don't, the trade probably looks better, not worse, even if the argument is that they aren't good enough to win anything this year. We don't know that for sure. I'm sure he's correct that the Phillies stepped and overpayed where no team was willing to do it, but they also got it done. One assumes they will also now factor a Realmuto extension into their budgeting of the Machado/Harper offers. Which is a double-edged sword - Harper and Machado don't really care about how good the team that signs them is. They want the most money. They aren't going to take less so they can help their new team pay Nola or Realmuto in two years. I guess I am sufficiently pessimistic about the possibility that Sanchez turns into anything (and I'm clearly not alone there), that's what makes this go down more easily. I think back to 2009 when Carrasco, Drabek and Jason Knapp were three of our top 10 guys. There's always a chance one of them hits but the chances of not are a lot higher. The ringer seems determined to keep lambasting the Phillies. I don't think signing Harper or Machado has much to do with evaluating this trade. A big free agent signing would of course make it better to risk giving up lots of value in a deal because we would be more certain to compete. But that really has nothing to do with evaluating the deal based on dollars and talent. Well I have already posted that I thought Sanchez and Alfaro was too high a price to pay for Realmuto, now that the deal is done, I have to hope the Phillies brass knows more than I do. I am sure they do, but I still consider the price for Realmuto as being a very high one. On a positive note, Realmuto should be an upgrade over Alfaro in 2019 and 2020. Sanchez has not thrown all that many innings in his 3 years in the system and has had significant arm problems this past season. He has tremendous potential but he may never reach it. I have read reports that the Phillies seem to have soured on him somewhat this off season. Again, I have to rely on them knowing more than I do. Defense really hurt the Phillies in 2018. Adding a full time regular shortstop and moving Hoskins to first base, replaced by a real outfielder in left, project to greatly improve defense. Another area that really hurt in 2018 was what seemed like an enormous number of passed balls. I hope Realmuto will reduce this in 2019. I think the Marlins got a very good return for Realmuto but like most deals, it might look different in a few years. For now, Realmuto is a Phillie and I am looking forward to watching him in 2019. In 08 the Phillies traded "future stud" Michael Bourn for All Star Brad Lidge. Lidge was the missing piece to a championship. I just don't think Realmuto is the one missing piece. Am I wrong here? I had high hopes of Alfaro being the next I-Rod in a year or two and was really excited about Will Stewart. I was mixed on Sixto. Marlins are about as excited about this deal as we were for the Hamels haul - no pun intended. Realmuto may be the best catcher in baseball, but Alfaro might be top 10 or is close to it. Catchers today are a pretty mediocre lot. This was a "win now" move where we overpaid in value to get a good player at a position where we already had an average player. Baumann is as close to a venerable Philly baseball blogger as there can be, one of the original Crashburn Alley people (all of whom have gone on to either better media jobs or team jobs). Was also at BP, then Grantland, now Ringer. Was Bourn ever a top 100 minor league prospect? Stud might be a bit much. We just traded two guys who were pretty consensus top 100 or better prospects (Sanchez is in the 20-30 range now. Would be top 10 if he had pitched more last year). Hes actually a Phillies fan! Used to write for one of the Phillies blogs, I dont think it was the Good Phight but I can't remember right now. edit: I should have read the rest of the thread, Zambonir clarified better than I could have. Was Bourn ever a top 100 minor league prospect? I also wouldn't compare an everyday catcher with a big bat to a closer. I think Baumann's question about Grandal is more valid. Could have signed him to a two-year deal and kept Alfaro too. Bauman was about $30 million off on our luxury tax situation though. Not saying he is the best analyst out there. Just reporting the article I saw. At least the next 2-3 years should be fun, assuming we get Harper or Machado. Realmuto and one of those 2 puts us in 90-win range in terms of projections (might be 86 now). The lack of a great farm system will potentially haunt us in 3 years as we have to start replacing people at a point where we are at the luxury tax line. Interesting trade, I like Realmuto and we have many examples of over-rating prospects, but this was a high price regardless. I think this could be read as another hedge move in case Machado and/or Harper are not signed or as an enticement to either of those guys to join a better team. They do seem to be focused on the position players and bullpen. Still depending on several young guns to help Nola and Arrieta to carry the staff. I hope to see them bring some competition in there as well.